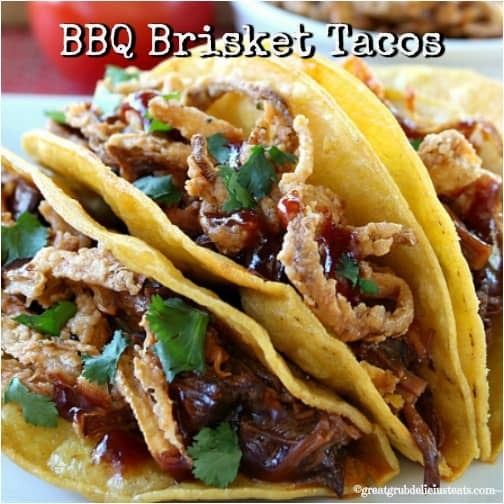 I’ve been dying to make these BBQ brisket tacos for some time. My man came home from the grocery store with a delicious looking beef brisket and I knew exactly what I wanted to make with it. All day while I was driving around for work, I kept thinking about how delicious these tacos were going to be. I was so excited about making them, everyone in the office knew what was on the menu this weekend. I had made the crock pot BBQ beef brisket especially to use for this specific recipe. The good thing about cooking a large brisket is there are lots of leftovers to use in many different recipes like this one. With just one brisket, we also had BBQ brisket sliders and BBQ brisket cheesy enchiladas. All were delicious! We used to eat tacos like these all the time at a local restaurant that is no longer in our area. These BBQ brisket tacos are soooo tasty. 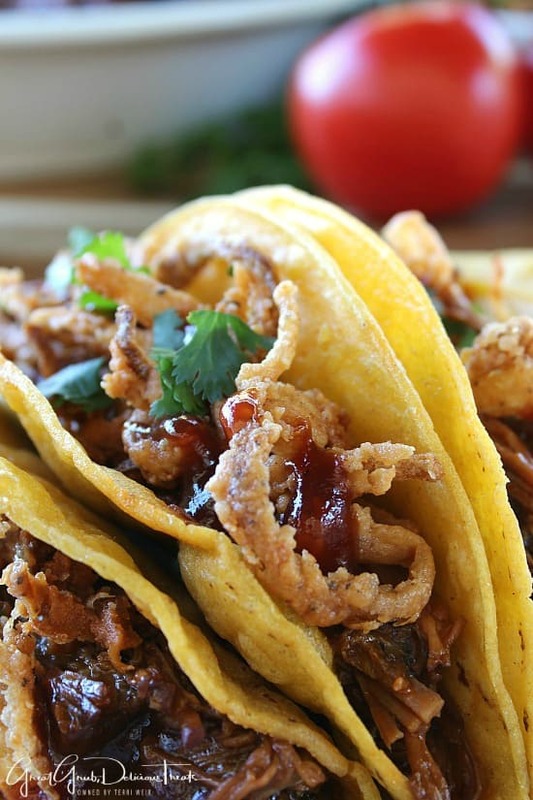 The onion strings make these tacos so much more delicious. Just look at these babies! Can you imagine just how wonderful the flavor is? You totally can enjoy these delicious tacos too. 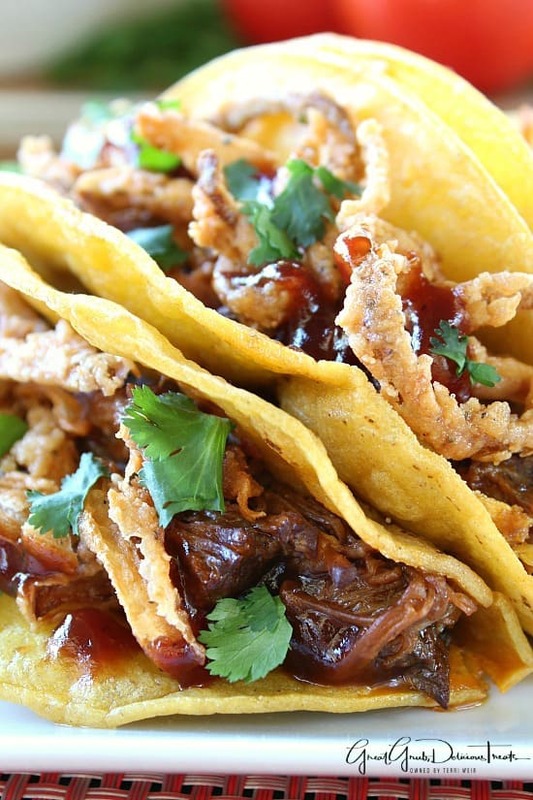 Just grab yourself a nice beef brisket, cook it in the crock pot, and then makes these wonderful, tasty tacos! For these tasty onion strings, which I mostly adapted from The Pioneer Women, make sure to cut the onion in extremely thin slices and then place into a large baggie (I actually cut my onion in half and then cut super thin slices). Pour buttermilk into the baggie, zip closed and let the onions soak for 30-40 minutes. While the onions are soaking, get another large baggie and place flour, garlic salt, pepper and slap ya mama® seasoning into the bag, seal it closed and shake to mix. Once the onions have soaked, place into the flour mixture, zip the baggie shut and shake to coat really well. Next, place onion strings into hot oil and cook until desired crispiness is obtained. Place onto a plate, lined with paper towels, and sprinkle with salt (optional). 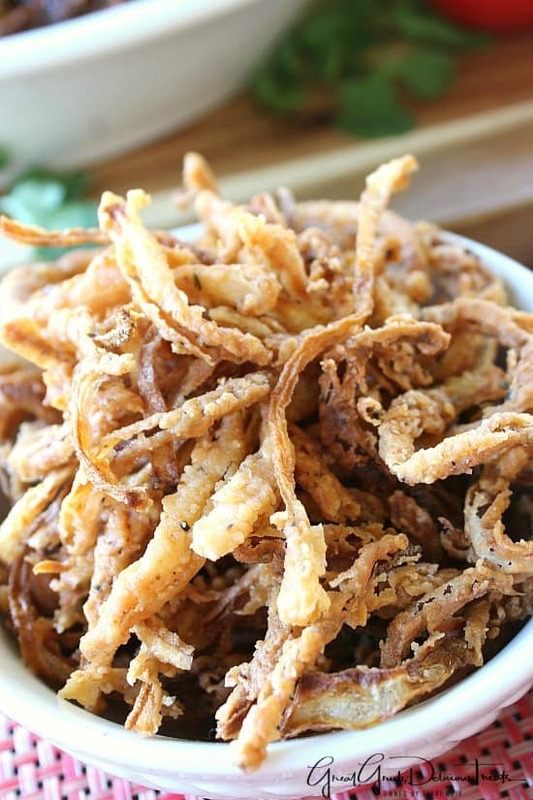 These onion strings are so good, even eating these by themselves make a great little snack that everyone will enjoy. When everything is ready, it’s time to assemble these tasty tacos. 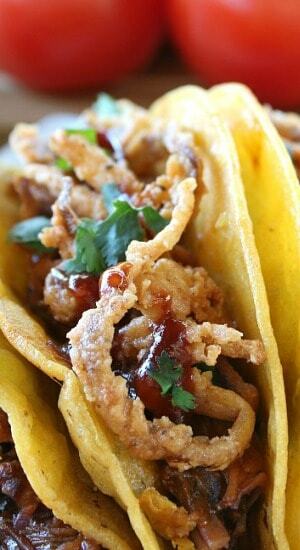 Just add a couple heaping spoonfuls of beef brisket to the taco shell, add some onion strings, a little BBQ sauce and top with cilantro! Oh yum! 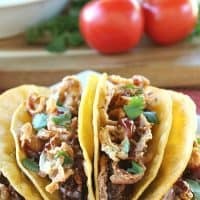 Tomatoes are great added to these tacos too! 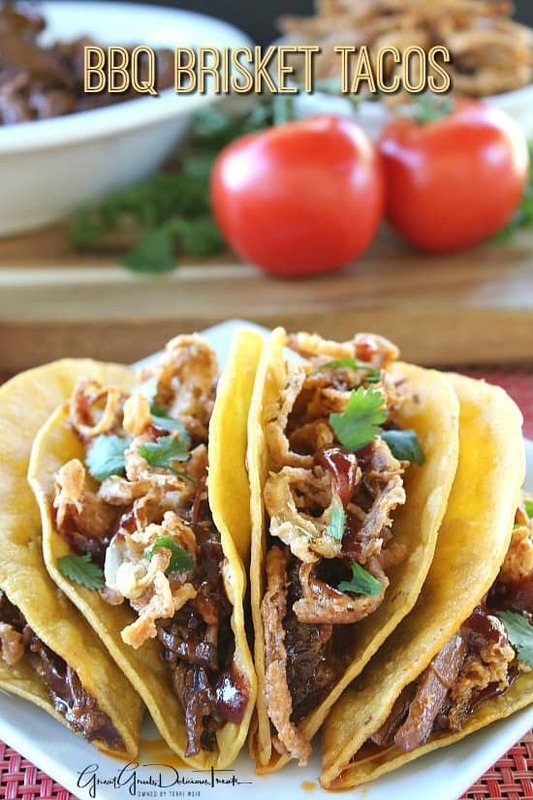 Load up each taco with the onion stings, cilantro and top with diced tomatoes for a fabulous meal! Once the crock pot BBQ beef brisket has been cooked, shred beef and set aside. Slice onion extremely thin and place in a gallon size baggie. Pour buttermilk over onions, zip baggie shut, and let sit for 30-40 minutes. Make sure onions are fully covered in the buttermilk. While onions are soaking, heat 1 1/2 (might need more) cups of oil in a large, deep frying pan, or a large pan over medium/high heat. In another large baggie, add flour, garlic salt, pepper, and slap ya mama seasoning, seal and shake to mix. Remove onions from buttermilk and add to flour mixture. Gently place onions in hot oil and cook, stirring occasionally, until desired crispiness is obtained (these might need to be done in batches if you do not have a large enough, deep, frying pan). Place on paper towel lined baking sheet once cooked. While onion strings are deep frying, heat remaining oil in another frying pan. 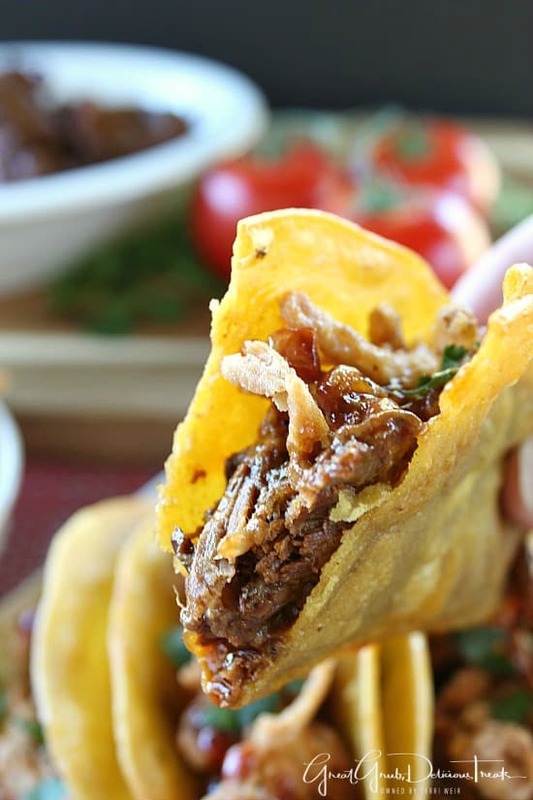 Fry tortillas to desired crispiness. Remove and place on paper towel lined plate until ready to assemble tacos. 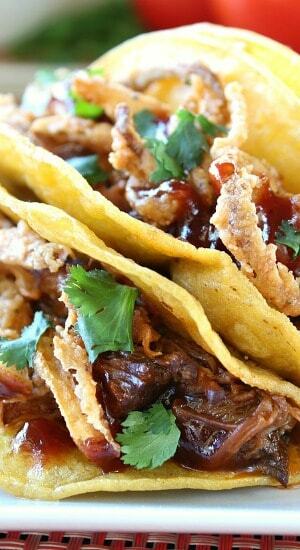 Take a couple heaping spoonfuls of beef brisket and add to taco shells, top with onion strings, then squeeze a little barbecue sauce on top of onion strings and top with cilantro.